Ardchattan Priory, Inveraray and many west coast islands. West Coast Motors operate buses on numerous local routes and you can view their timetables on their web site. See TravelineScotland for timetables for all bus connections. Oban station is at the end of the line which branches off from the main Glasgow to Fort William railway. Hebridean Air Services has flights between Oban airport and the islands of Islay, Tiree, Coll and Colonsay. The airport is suitable for small aircraft only. Fly Scenic Scotland offers sightseeing trips from Oban airport in a 4-seater or 8-seater plane. Booking required. Tel: 01236 734672. You can take lots of day trips from Oban by ferry to nearby islands. There are also many private boats advertised around the harbour which make regular trips over to Duart Castle on the Isle of Mull. Visit the local tourist office for dates and times of all the boat trips available. It is also possible to visit Mull, Iona and Staffa on combined ferry and coach day-trips from Oban. See below for details. Wildlife boat trips on the spacious catamaran Mara Mhor start from the Corran Esplanade Slipway (opposite the Regent Hotel). Dolphin, seals and birds may be seen. Cruises include a 2-hour cruise around the isle of Kerrera, a half-day trip into the Sound of Mull to spot eagles, and a 1-hour trip to the seal colony. Contact Ron Stevenson. Mob: 07774 475995 / Tel: 01631 563387. Charters by request. Allan's seal trips take on a little boat called the MV Purple Heather from the railway pier. Mob: 07732554746 / Tel: 01631 565 059. Basking Shark Scotland offers unique snorkelling trips from their boat out of Oban. Trips operate from April until October (the peak season for sharks June - August). Telephone 07975723140. The National Kayak School based in Oban offers canoeing courses and holidays, and also has the Sea Kayak Oban shop & outfitters in Argyll Street, just off George Street. Tel: 01631 565 310. Stramash offers adventure days with sea kayaking, white water kayaking, coasteering, canyoning, gorge scrambling, rock climbing & abseiling, open canoeing, dinghy sailing, bushcraft, mountain skills and much more. Individuals, groups and schools welcome. Tel: 01631 566080. Advance booking is required for all these cruises. Hebrides Cruises sail from Oban offering wildlife cruises and holidays around Argyll, Skye the Outer Hebrides and St Kilda. The 'Elizabeth G' sleeps 12 guests, and 'Speideren' sleeps up to 8. Private charters available. Sails and Summits offer skippered sailing holidays exploring the west coast of Scotland & the Hebrides. This ocean sailing cruiser with crew is available for up to 5 people. No experience required. Trips range from 3 to 10 nights. Hill walking, mountain and gorge scrambling, rock climbing, abseiling, kayaking and canoeing can be arranged. RYA navigation courses also available. Based in Oban. The Majestic Line operate 3 and 6-night cruises from Oban (and from Holy Loch, near Dunoon) in converted traditional wooden vessels with 6 cabins (for 12 guests) to explore the coastline and islands of Argyll. April to October. Hebridean Princess - small cruise ship (48 guests) offering 5 star luxury accommodation and food. Sails from Oban. Variety of itineraries on the west coast and Hebrides. March - November. Munro's Garage (tel: 01631 567439) - the local Avis agent. Weather forecasts for Oban are provided by Yahoo. Also check out the Oban webcams. Kathleen Cameron is a professional Scottish tour guide living in Inveraray (tel: 01499 30 2361 or mobile phone: 07777 5691641). For walking or driving tours in cities, towns, or countryside, she can accompany groups of any size, from independent travellers (up to 7 in her own vehicle) to coach parties. Tours can be started from any destination including Edinburgh or Glasgow. Fluent in Spanish. Thanks to the ferry and railway, this is a busy town with many shops, banks, supermarkets, garages, and post office. It is the ideal place to stay and explore the surrounding area or to stop overnight if you are on your way to the Isle of Mull. Known as the Gateway to the Isles, it has a population of some 8,500. Oban is now known as the Seafood Capital of Scotland, and indeed it offers a great taste of Scotland with its many seafood restaurants, chocolate shop and whisky distillery). Ferries leave Oban for the following islands: Islay, Colonsay, Coll, Tiree, Mull, Lismore, Barra and South Uist. Numerous day trips are possible - see below for ferry day trip details. 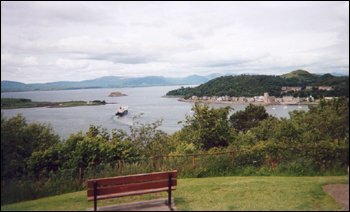 Many day excursions are possible from Oban by car. Visitors without transport will need to check out the local bus timetables (see West Coast Motors). You can also take advantage of the Citylink coach services which operate on the road north to Fort William, on the road south to Lochgilphead in Argyll and Kintyre, and also inland to Inveraray (see below). There are lots of shops, pubs and restaurants in Oban including major chains such as Boots, WH Smiths, Waterstones, Tesco and the Co-op. For eating out click here. Right by the railway, on the pier is a modern centre aimed at tourists with souvenir shops, cafes and the ferry office. Internet access is available at Oban Library at 77 Albany Street (closed Tuesdays & Sundays). Nancy Blacks in Argyll Square is a marvellous store full of chandlery goods and outdoor clothing & equipment. Gift shops with a difference include Orsay (on the corner of Stevenson Street and George Street, near Waterstones) and Room 15 (on Stafford Street, between the distillery and the North pier). The Iona Shop next to the Caledonian Hotel specialises in jewellery and gifts. 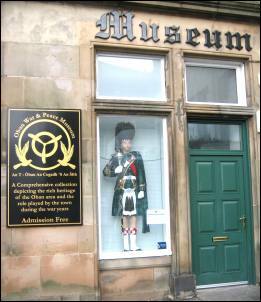 The Oban War & Peace Museum is in the old Oban Times building, near the Regent Hotel and the North Pier. Open daily from March to November. Admission free. Tel: 01631 570007. How about a trip to the Oban Chocolate Factory? They have a cafe, shop and factory down on the Corran Esplanade just past the War & Peace Museum - tel: 01631 566099. Open daily from Easter to late September (closed on Sundays in the winter). Closed throughout January. Not far from there is The Gem Box which is an amazing treasure trove of jewellery and precious stones. Oban Phoenix Cinema is in George Street. 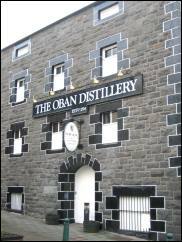 The Oban Distillery Visitor Centre in Stafford Street (near the North Pier) is open Monday to Friday from March to November (plus some weekends in summer) for guided tours. There's an audio visual exhibition and gift shop. Telephone 01631 572 004. The new VisitScotland tourist information centre is on the corner by the North Pier (near the restaurants called Piazza and Ee-usk): please note this is not the pier where the Calmac ferry terminal is situated. 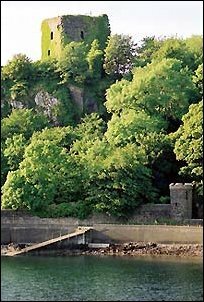 The bay is dominated by McCaig's Tower, a replica of the Colosseum of Rome. A banker called John McCaig had it built between 1897 and 1900 as a memorial to his family and to provide employment for the townsmen. It's quite a steep climb to the top of the hill, but there are a couple of benches where you can sit and get your breath back. On a clear day you can see over to Mull. Some books call it McCaig's Folly. He was born on the nearby island of Lismore (see below). Photo courtesy of Lorna Campbell who is a relative of the late John Stuart McCaig (who founded the McCaig Tower). You can also visit the cathedral which is located on The Esplanade. The Atlantis leisure centre in Oban includes swimming pool, sauna and gymnasium. Nearby there are tennis and squash courts and a bowling green. Just on the outskirts of town is Glencruitten Golf Course (18 holes). 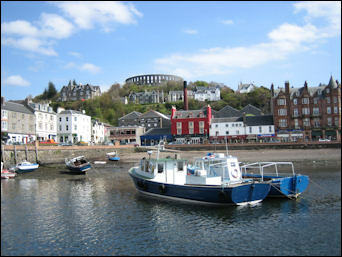 For yachties, Oban Marina is situated in the shelter of Kerrera. There is a regular shuttle service passenger ferry running from the marina to Oban town centre (mob: 07749307600 / tel: 01631 565333). Ganavan Sands just 1.75 miles north of the centre of Oban. Picturesque sandy beach with toilets & car park. The Oban Times (local newspaper) has a useful tourist map of Oban which you can download for free. The Skipinnish Ceilidh House (upstairs in George Street overlooking Oban harbour) regularly features authentic Highland music and local bands. Tel: 01631 56 95 99. Caledonian MacBrayne which offers day cruises to the islands, plus dinner cruises also available. 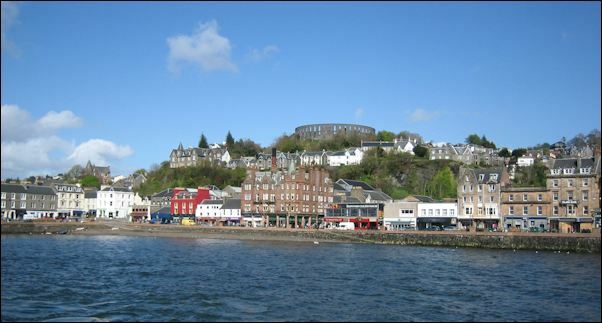 West Coast Tours in Oban (tel: 01631 566 809). Variety of full day trips to Mull & Iona with the option of including Staffa and/or the Treshnish Isles. Gordon Grant Tours opposite Oban railway station on the pier (tel: 01681 700338 / 01631 571112 / 01631 562842). Variety of coach & boat trips departing from Oban: Mull, Iona, Staffa and Treshnish Isles. Boat trips are also available to Staffa and Treshnish Isles from Mull and Kilchoan (Ardnamurchan peninsula). Online booking available. Turus Mara boat trips from Mull to Staffa/Iona. Get the ferry from Oban to Craignure and then board their courtesy (advance booking required). Telephone 01688 400 242 or freephone 08000 85 87 86. Alternatively, book through the Turus Mara office at 1 Waterfront (The Restaurant), Railway Pier, Oban (Tel: 01631 566999) or through the Oban Tourist Information Centre. The Calmac package for Duart Castle enables you to travel by ferry from Oban to Craignure and board the bus to visit Duart Castle without taking your own car. This operates from May to mid October. You can get your travel tickets from the Caledonian Macbrayne ferry office in Oban. CalMac operates a day cruise to the isle of Coll plus a guided tour of the island. Visit the CalMac ferry web site for details. Sundays, Mondays, Wednesdays from 27 March - 28 September 2016. Based in Easdale (south of Oban), Sea.fari Adventures (Oban) offer regular trips in a rigid inflatable boat. These include the Corryvreckan whirlpool, Colonsay, Iona/Staffa, the Garvellachs and whale watching. Visit Scotland 4 star wildlife trip boat operator. Private charter available. Tel: 01852 300003. Coastal Connection have 2 cabined RIBs for charter based in Oban. Tel: 01631 565833 / 07919615210. From Oban, a small Cal Mac ferry takes you over to Lismore (10 miles long and 1.5 miles wide) in 50 minutes. If you want a short sea-cruise, why not just go there and back. No Sunday service. A small passenger ferry also sails to the island from Port Appin. The island is home to nearly 300 types of plant and 130 species of birds. For a peaceful 'get away from it all' destination it is ideal. There are several ruined castles, brochs and duns. Read more and see photos on the Isle of Lismore page. The castle ruins dominate the skyline overlooking the northern entrance to Oban harbour. This was the seat of the MacDougalls, the Lords of Lorne, who once owned a third of Scotland. This image is copyright Colin Palmer stock photo library (prints and posters available for purchase). Once the capital of Dalriada, the original Kingdom of the Scots, it was to here that The Stone of Destiny was originally brought over from Ireland via Iona. 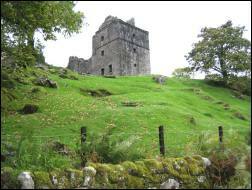 This huge, ruined castle is now in the care of Historic Environment Scotland. Open all year: April-September 9.30am-5.30pm, October-March 10am-4pm. In winter, it is closed on Thursday and Friday. Admission charge. Telephone: 01631 562465. 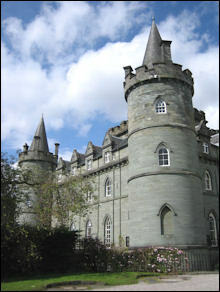 Click here for full details, history and photos on the Chatelaine's Scottish Castles web site. At nearby Dunstaffnage Marina there are facilities for yachts, plus the popular Wide Mouthed Frog restaurant. Also home to Oban Sea Fishing. The Ocean Explorer Centre opened in 2013 next to Dunstaffnage Castle. Exhibitions, underwater observatory, gift shop and cafe. Open Monday to Friday from 10am to 4pm. This is a visitor and outreach facility of the Scottish Association for Marine Science (SAMS). 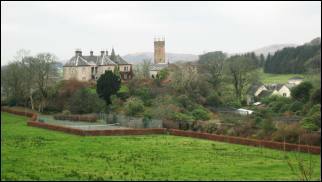 It is one of three Valliscaulian houses and was founded in 1231 by Duncan MacDougall, Lord of Lorne. It is said that the last Parliament meeting to be conducted in Gaelic was held here by Robert the Bruce in 1308 or 1309 (depending on which history books you read). The history books also say that it was burned by Cromwell's soldiers in 1654. The house is apparently the second oldest inhabited house in Scotland. Honesty box for access to the gardens and priory ruins which are open 9am-6pm from 1 April (or Good Friday if earlier) - 31 October. Web site. The Kintaline Farm Plant and Poultry Centre at Benderloch includes poultry and waterfowl breeding park & plant nursery full of interesting perennials, herbs and alpines. Fresh Eggs for sale always. Phone 01631 720223. The village has several hotels and bars. From here you have views of the famous tidal Falls of Lora. The bridge crosses Loch Etive. Connel Airfield is nearby. Sitting just a few hundred metres from the shore of Loch Creran, the castle can be found to the south-west of Barcaldine. Please respect the owners' privacy. B&B available. Tel: 01631 720598. Situated about 20 miles north of Oban and 27 miles south of Fort William. Look for the signposts from the main A828 road to the village and you will get a good view of Castle Stalker. There's a craft shop (closed in winter) and a general store. 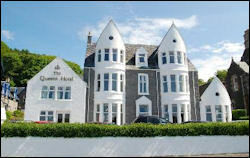 The 4 star Airds Hotel offers excellent accommodation and food by the Scottish National Hotel Chef of The Year 2007. Near there you will see an old lighthouse lantern which now contains a display about the area. The Pierhouse Hotel & Seafood Restaurant was awarded AA Seafish Pub of the Year for Scotland 2007. Famous for the murder dramatised by Robert Louis Stevenson in his novel "Kidnapped". The incident occurred in 1752 when Colin Campbell of Glenure ("The Red Fox") was shot and fatally wounded. His assailant escaped and an innocent man was tried, then hung some months later. 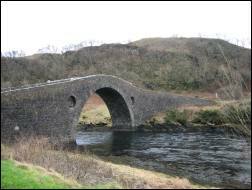 If you want to see where James Stewart was hanged, then look for the white stone on a rock plinth just above the road at the Ballachulish Bridge. It is said that the name of the true murderer, possibly the convicted man's son, has been passed down through the centuries by word of mouth and Campbell's ghost is reported to have been seen on more than one occasion. Just south of the centre of Oban, you can cross over to Kerrera. At one end of this 4-mile long island stands the monument to David Hutcheson, the first man to start a regular ferry service over to the Hebrides. At the other end is the recently restored Gylen Castle, known as the castle of fountains, which was once a stronghold of the MacDougalls. The island's other claim to fame is that Alexander II died in Horseshoe Bay in 1249 whilst attempting to recover the Hebrides from King Haakon IV of Norway. Kerrera is home to wild goats, Soay sheep, otters and seals. Some of which you might see if you're lucky. The tea garden is open Wednesdays - Sundays from Easter to September. A bunkhouse is also available (Tel: 01631 570 223). To reach the island, you need to take the 12-passenger ferry about 2 miles south of Oban on the Gallanach Road. Ferry crossings at 8.45am, then every 30 minutes from 10.30am - 12.30pm and from 2pm - 6pm in summer (less frequently in winter). Rotate the ferry board to black to attract the ferryman's attention. Kerrera is also home to Oban Marina which runs a passenger ferry to/from Oban North Pier (look for the blue boat called Kerrera). They also offer moorings, repairs, chandlery, storage, toilets/showers/laundry, fuel, etc. Tel: 01631 565 333. The Isle of Kerrera Development Trust is the local community web site. Take a 2-hour cruise around Kerrera on the spacious catamaran Mara Mhor - starting from the Corran Esplanade Slipway (opposite the Regent Hotel in Oban). Dolphin, seals and birds may be seen. Contact Ron Stevenson. Mob: 07774 475995 / Tel: 01631 563387. This links Seil Island to the mainland. Designed by Telford in 1792, it has a very high back and is host to a rare species of fairy foxglove. After the Jacobite rising of 1745, the wearing of kilts carried the death penalty and so it was here that the Highlanders changed their clothes when venturing across to the mainland. Next to the bridge, you'll find petrol pumps and a kiosk where you can buy local photos, plus an inn called Tigh an Truish (House of the Trousers) where they serve excellent pub food including vegetarian options. 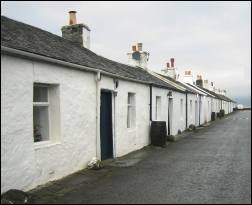 The main settlement on the small island of Seil is Ellanabeich, a picturesque village with several rows of white cottages built for the quarry workers and their families. Almost everything here seems to be made of the local slate, even garden tables and chairs. Public toilets are situated near the pier. For more info visit the Seil community web site. There are tourist shops plus the Oyster Brewery, Bar and Restaurant and the Highland Arts Exhibition (gift shop featuring the works of the late C J Taylor, free tea and coffee, picnic area and putting green). From April to October you can visit the An Cala gardens on Seil. In the south-east tip of the island, you can find the Ballachuan Hazel Wood nature reserve which has over 250 different species of lichen. Opposite Ellanabeich is an even smaller island called Easdale (51 inhabitants). Boats go over regularly during the day to take you the 400 metres from Seil to Easdale. The Easdale Folk Museum is open from April to October (the curator, Jean Adams can be contacted on Tel: 01852 300370). The Puffer Bar has a tearoom and restaurant. Each September it hosts the World Stone Skimming Championship. The neighbouring Isle of Luing also has its own web site. 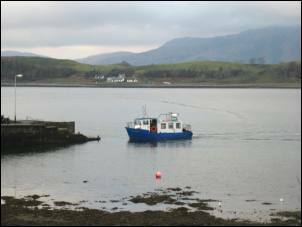 A regular vehicle ferry operates on the 3 minute crossing from Seil to Luing (phone Argyll & Bute Council on 01631 562125). Once on the island you can hire a bike (phone 01852 314274) or get a trip around with the Postbus at certain times. Based at Balvicar pier, Sealife Adventures offer a variety of trips including the Corryvreckan whirlpool, Garvellachs and whale watching. Tel: 01631 571010 / 01852 300203. Based in Easdale, Sea.fari Adventures (Oban) offer regular trips in a rigid inflatable boat. These include the Corryvreckan whirlpool, Colonsay, Iona/Staffa, the Garvellachs and whale watching. Private charter available. Tel: 01852 300003. 8 miles south of Oban, you will see the signs for the B844 to Easdale / Seil. About a mile before you reach the Bridge over the Atlantic, follow the signs for Armaddy Castle Gardens along the single track road. Admission is for a small charge via an honesty box. Plants and vegetables from the garden are for sale. There is a toilet. Please note the castle is not open to the public. However, there are holiday cottages on the estate which you can rent for self catering. 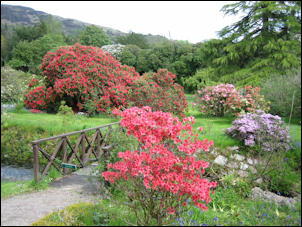 Member of the Glorious Gardens of Argyll More details. Village on the A816 where The Quaich operates as the local cafe, post office, general store and crafts gallery. Kilmelford community web site. About 1.5 miles from the main road is Melfort Village - a self catering complex which includes the Shower of Herring - a bar/restaurant open to non-residents (tel: 01852 200 345). Near here is Melfort House - a luxury country house B&B. Halfway between Oban and Lochgilphead on the main road (A816), look for the brown tourist signs indicating the turn to the gardens and the Loch Melfort Hotel (formerly Arduaine House). Owned by National Trust of Scotland and a member of the Glorious Gardens of Argyll, Arduaine Garden has various routes you can explore depending on the time you have available. Well known for its rhododendrons in particular, there is also mixture of woodland, ponds and a coastal viewpoint. The garden is open all year in daylight hours. The reception centre is staffed from April to end September. Telephone 01852 200366. The Loch Melfort Hotel bar and restaurant have a great view of the loch and islands, so it's well worth stopping for a bite to eat even if you are not staying at the hotel. Further down the A816 is the Craobh Haven marina which has plenty of facilities for yachts. The brightly painted houses form a new village which also includes a pub. Local facilities include the marina at the Ardfern Yacht Centre, boat trips by Craignish Cruises and the Ardfern Riding Centre. Aird Farm Holiday Cottages offer 4 star and 5 star self catering accommodation, 3 miles outside Ardfern. 2 miles north of Kilmartin you will see signs to the car park from where you can start the walk across the fields to Carnasserie Castle. The ruins are now owned by the National Trust for Scotland and can be visited. Admission is free. There are no floors intact in the main hall but there are towers on each end which can be climbed. This is a good example of a French Renaissance-influenced tower-house with hall-house, built in 1565. 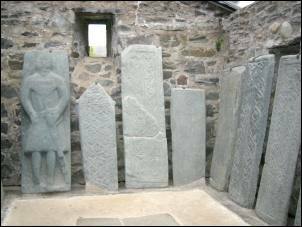 In Kilmartin churchyard are some magnificent carved gravestones. Around Kilmartin Glen many prehistoric and medieval monuments can be found including burial cairns, stone circles and cup-and-ring engravings. Some of these historic sites are 5000 years old. The ancient hill fort at Dunadd was once the capital of Kingdom of Dalriada where kings were crowned. Kilmartin House Museum (in the village of Kilmartin) has an exhibition, gift shop and tearoom. Various events and workshops are organised. The museum is open daily from March to October. Reduced opening hours in November and December, then closed January and February. Tel: 01546 510 278 to check. 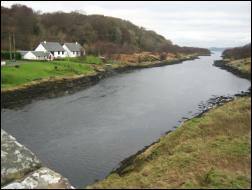 The Crinan Canal takes boats the 9 miles between Crinan on the west coast and Ardrishaig on Loch Fyne. 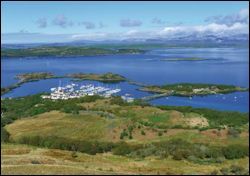 You will probably see lots of yachts at Crinan which has a chandlery and boatyard, as well as various places to eat and stay. From Lochgilphead you can head further south down to Tarbert on Loch Fyne and the historic sites on the Kintyre Peninsula which has ferries to the Cowal peninsula, Isle of Gigha, Islay and Arran. 12 miles east of Oban is the village of Taynuilt. Go down to the pier and you can have a cruise on this beautiful loch. A 90-minute cruise departs at 10am and 12 noon every day (except Saturday) from May to September. A 3-hour cruise departs at 2pm every day (except Saturday) from April to October. Details on the Loch Etive cruises web page. Telephone: 01866 822 430. Taynuilt also has a nice tearoom called Robin's Nest. Inverawe Smokehouse (restaurant and tours) is nearby and specialises in smoked salmon and trout. 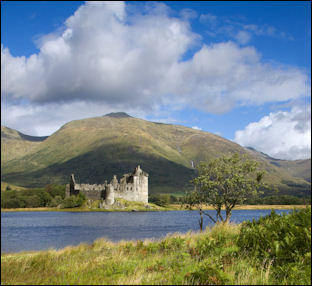 East of Taynuilt and 2 miles west of Dalmally is Loch Awe with the picturesque ruins of Kilchurn Castle. The castle is owned by Historic Environment Scotland and admission is free. You can walk to it from the Dalmally road (A85) under the railway viaduct. 25 miles in length, Loch Awe is longest freshwater loch in Scotland. From Loch Awe Boats (on the B840 road, 3 miles south of Cladich, off the A819 Dalmally to Inveraray road) you can hire motor boats, rowing boats and canoes - tel: 07703112422. The 5 star award-winning hydro electric power centre on Ben Cruachan (3281 feet) is open to visitors with guided tours, a free exhibition plus a cafe and picnic area. In the village of Lochawe be sure to stop for a look around St Conan�s Kirk - a magnificent church perched on the shore of the loch. This the pale, baronial castle, hidden amid the dark green trees, appears almost as a vision from a fairy-tale. Seat of the Duke of Argyll, chief of the clan Campbell, the original castle was rebuilt, together with the town in the mid-eighteenth century. The present Duke of Argyll lives here with his wife Eleanor who is a descendant of the Cadbury chocolate dynasty. The castle is open to visitors daily during the summer season (April - October) but only for afternoons on Sundays. Tearoom, toilets and gift shop. 16 acres of grounds. Free access to the woodland walks. For prices and opening times of the castle, visit the official web site: www.inveraray-castle.com. 18th century royal burgh sitting on the shores of Loch Fyne. For a good view of the surrounding area, climb to the top of the Bell Tower of All Saints' Episcopal Church. There are numerous shops including an old style pharmacy, Woollen Mill and Loch Fyne Whiskies. Try the George Hotel on the main street for a nice meal. Photo Copyright © 1994 Corel, The Internet Guide to Scotland and its licensors. All rights reserved. Not to be downloaded or reproduced. Inveraray saw much wartime activity in the 1940s. Tigh-an-Ruadh (now the Loch Fyne Hotel) was turned into the HQ for Combined Operations Training. A plaque at the hotel commemorates those who visited at that time - including King George VI, de Gaulle, Eisenhower and Winston Churchill (who held some of the War Cabinets here). This award-winning museum is well worth a visit. It includes a torture and punishment exhibition, the old courtroom which is set out as it would have been in the 1800s, the Old Prison built in 1820 and the New Prison which dates from 1848 from where convicts were sent to Australia. You will meet warders and prisoners walking about in costume. Since these are old buildings, disabled access is limited to the shop, information room, toilet, courtyard and the ground floor corridor of the Old Prison. Open every day April - October 9.30 am - 6 pm. Winter 10 am - 5 pm. Telephone: 01499 302 381. Full details on the Inveraray Jail Museum web site - also includes interactive tour and information about prisoners who were transported to the Colonies. Located on Loch Fyne, 12 miles south of Inveraray, this is a spectacular 50-acre woodland garden which is particularly beautiful in Spring and Autumn. Gardens are open all year. Visitor Centre open daily from 1 April to 30 September. Owned by The National Trust for Scotland. One of the Glorious Gardens of Argyll. overlooking Oban Bay and the Firth of Lorne. Originally a large private house, now extended. Full-length sun lounge with spectacular sea views. outdoor hot tub, health & beauty treatments. Bar and restaurant with excellent reputation especially for seafood. Scottish Tourist Board 3 Stars. AA 3 Stars. 80 ensuite bedrooms with TV, tea/coffee, etc. Choice of standard rooms, executive rooms & 4 poster suites. 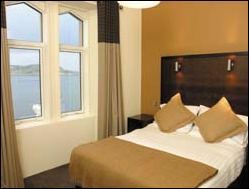 with wonderful views across Oban Bay. A friendly hotel with restaurant & lounge bar. Within walking distance of the pier and town centre. 1 mile from the railway station. A few minutes walk from Dunollie Point. (superking doubles, twin and single). All with telephone, TV, tea/coffee, etc. Most with Jacuzzi® whirlpool bath or extra large shower. B&B prices from £32.50 per person. on the North Pier in the middle of town. with high ceilings and elegant cornices. Restaurant with good food and service. 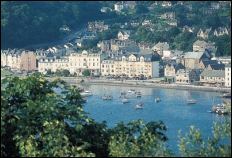 (most with views of the sea and harbour). All with telephone, Sky TV, hairdryer, tea/coffee. Upgrade to superior bedrooms available. including a hot and cold buffet breakfast. close to the harbour and ferry terminal. Traditional Scottish hospitality with quality modern surroundings. Private car park. AA 3 Stars. Restaurant, lounge and ceilidh bar. (including the famous Scottish Show with Torquil the Piper). Free Wi-fi access in all public areas. Choice of 91 ensuite bedrooms (single, twin, double). All with TV, telephone, hairdyer, hospitality tray. B&B prices from £27 per person. Scottish Tourist Board 4 Star Inn. overlooking the famous Falls of Lora. Just 5 miles north of Oban. Restaurant with views over Loch Etive to Mull, Lismore & Morven. Lunches, afternoon teas and evening meals. with cosy log fire and regular local live music. all with TV, DVD, CD player, radio. Winter Warmer Suppers available December to March. over Oban Bay and across the sea to the islands. open plan kitchen/dining room and lounge. Lift to all floors. Shared laundry room. Open April - October inclusive. 22 miles south of Oban. There are lots of guest houses and hotels in and around Oban, some are advertised on the Oban and Lorn Tourism Association web site. Airds Hotel & Restaurant - excellent accommodation and food. AA4 Red Stars & 3 Red Rosettes. Scottish National Hotel Chef of The Year 2007. Situated in Port Appin. Approximately 20 miles north of Oban and 27 miles south of Fort William. Tel: 01631 730236. Braeside Guest House overlooking Loch Feochan is 3 miles from Oban. Scottish Tourist Board 4 Stars. Evening meals available. Contact Jon Freeman. Tel: 01631 770243. Briarbank Guest House in Oban offers ensuite accommodation including 4-poster bedrooms. Scottish Tourist Board 4 Stars. Contact Julie Grove. Tel: 01631 566549. Collaig House is a luxury B&B at Kilchrenan near Loch Awe (20 minutes from Taynuilt, 35 minutes from Oban). Contact Jamie & Julie Beamish. Tel: 01866 833202. Craig Villa Guest House offers 3 star accommodation in the Strath of Orchy at Dalmally by Loch Awe. 5 ensuite bedrooms & 1 with private bathroom. 30 minutes from Oban. Contact Rebecca and Oscar Cressey. Tel: 01838 200255. Dunheanish Guest House is a large detached villa in Oban with 6 ensuite bedrooms. Instant online booking available. Tel: 01631 566556. 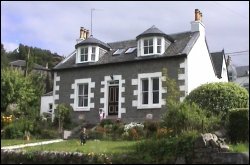 Glenlockhart Bed & Breakfast has 3 bedrooms and is situated 5 minutes walk from the main square in Oban. Contact Rob and Linda Allan. Tel: 01631 562571. 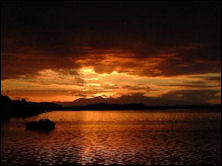 Isle of Eriska Hotel, Spa and Island offers luxury 5 Star Gold accommodation on a private island. Accessible by private bridge, approximately 12 miles north of Oban and 40 miles south of Fort William. 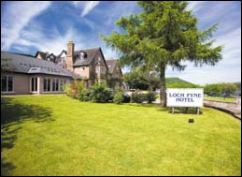 Loch Melfort Hotel and Restaurant - spectacular views across the Sound of Jura to the islands. Situated adjacent to Arduaine Garden, 19 miles south of Oban. Award-winning food. B&B rates or Dinner, B&B packages. Sand Villa Guest House in Breadalbane Street, Oban, has 6 ensuite bedrooms. Contact Joyce Gibson. Tel: 01631 562803. The Old Manse Guest House is a 4 star guest house in Dalriach Road, Oban, overlooking the bay. Choice of ensuite double/twin rooms, family suite or kingsize luxury rooms. Set in secluded grounds. 2 minutes walk from the town centre. Contact Anna and Simon - tel: 01631 564886. Aird Farm Holiday Cottages offer 4 star and 5 star self catering accommodation. The house sleeps 6 in 4 bedrooms and the luxury cottage sleeps 2. Situated between Oban and Lochgilphead, 3 miles outside Ardfern. Bolt Hole Cottage in Ellenabeich on the Isle of Seil sleeps 4 in 2 bedrooms. Scottish Tourist Board 4 stars. Accommodation is all on the ground floor. Burnside Cottage in the village of Furnace, 8 miles south of Inveraray, sleeps 5 people. Self catering available per night or per week. Craigdhu on Barbreck Farm near Ardfern is a farmhouse with 5 bedrooms sleeping up to 9. Lochgilphead 16 miles. Oban 23 miles. Cnocaruan Self Catering at Connel is a 4 star property overlooking the famous Falls of Lora. Sleeps 4 in 2 bedrooms. Contact Gabriella & George McKenzie. Tel: 01631 710378. 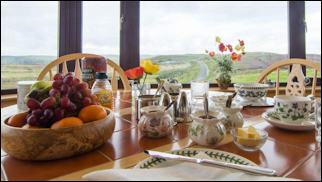 Creagard Country House is available to rent for self-catering holidays on the Isle of Luing. Four 19th century stone quarriers cottages have been combined into this house which sleeps 7 people. Loch Awe Log Cabins offer a variety of self catering properties at Dalavich. Seabank is a large 5-bedroom farmhouse (sleeping up to 10) on the shore of Loch Creran. Situated in Benderloch, near Barcaldine, 20 minutes north of Oban. Spring Cottage sleeps 6 in 3 bedrooms and is ideal for families, sitting on the shores of Loch Creran, 1 mile from Port Appin village, 16 miles north of Oban. Tralee Bay Holidays offer self catering lodges and caravans to rent all year round just north of Oban. SHYA Hostel on The Esplanade at Oban. 4 star SYHA hostel. 100 beds. Tel: 01631 562025. Inveraray Hostel, Dalmally Road, Inveraray. Tel: 01499 302 454. Argyll Caravan Park overlooking Loch Fyne near Inveraray. Serviced pitches for touring caravans, plus static holiday homes for hire. 5 star holiday park with bar, diner, playpark and indoor recreation area. Tel: 01499 302285. Oban Caravan and Camping Park is at Gallanachmore Farm (tel: 01631 562425 / fax: 01631 566624). Roseview Caravan Park, Glen Shallach Road - tel: 01631 562755. 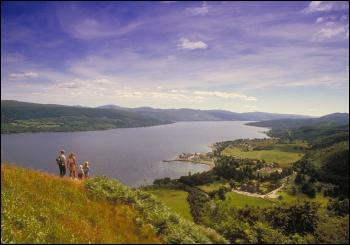 Strathlachlan Caravan Park is on the east shore of Loch Fyne, 6 miles from Strachur. Tel: 01369 860300. Sunnybrae Caravan Park has 6 mobile homes to rent on the Isle of Luing. Tel: 01852 314274. 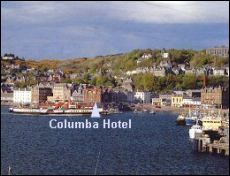 There are lots of places to eat in Oban, including many of the hotels. Coast is an awarding-winning contemporary restaurant in George Street, and Cafe Coast is just around the corner. Cuan Mor is a great gastro pub overlooking the harbour at 60 George Street. The Spinnaker Cafe is located upstairs at 28 George Street overlooking the harbour. The Gallery Restaurant in Argyll Square is highly recommended. The Waterfront Restaurant (by the main ferry pier) is renowned for its seafood, as is Ee-usk on the North pier. For pasta and pizza, try Piazza (also on the North Pier in one of the red roofed buildings). The Seafood Temple is a small family run restaurant on Gallanach Road, just past the ferry terminal. Tel: 01631 566000. For takeaway fish and chips, try the original Oban Bay Fish & Chip Shop on George Street (next to the back entrance to the Caledonian Hotel, opposite Waterstones) or Norries which is further up George Street. For vegetarian and health foods, try Millstone Wholefoods shop at 15 High Street. Also visit The Kitchen Garden at 14 George Street (tel 01631 566332) which has delicatessen and includes a coffee shop with views over the bay. For suggested hiking routes, get the book called Walk Oban, Mull and Lochaber. Written by Richard Hallewell it is a handy 64-page spiral bound book printed by Collins Cartographic. Oban and Mull Tourist Map. This book contains a comprehensive history of the slate industry in the west of Scotland, complete with a detailed and vivid account of the communities on the Atlantic bound islands of Easdale, Seil, Luing and Belnahua. The author Mary Withall is the Easdale Island Folk Museum archivist. 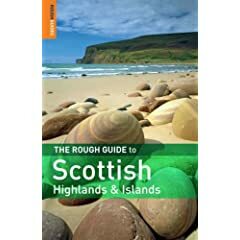 Part of the Exploring Scotland's Heritage series and is a very useful guide to these parts of the country. This 192-page paperback is about 15 US dollars. Collection of old photographs from the days when pleasure steamers filled Oban Bay and McCaig's Folly had yet to be built. Section One features Inveraray to Port Appin - including Dalmally, Lochawe, Taynuilt, Bonawe, Ardchattan Priory, Lochnell Castle, Eriska, Barcaldine Castle, Castle Stalker and Lismore. 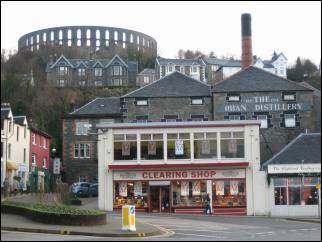 Section Two covers the town of Oban and its maritime and commercial activities. Also includes Dunollie Castle, Ganavan Sands, Dunstaffnage, Connel, etc. Section Three is entitled 'Oban to Dunadd' and begins with pictures of Oban's South Pier and Lighthouse Pier, before continuing southwards to the Slate Islands of Kerrera, Seil, Easdale and Luing.